The trail looked much like many of the hiking trails I had tread upon within the Florida Panhandle. The path was sandy in some places, and relatively narrow. The towering pines had dropped their long needles into the trees and shrub below, where they hung like icicles from leaves and twigs before eventually falling to the ground. Palmettos bunched together, becoming an even brighter green when the sun shown through their fronds. A wooden walkway covered a creek, the water flowing crystal clear and revealing a pure sand river bottom. Though it looks like many other trails, this one is special: it is a segment of the Florida National Scenic Trail. In fact, the trail – which is nearly 1,000 miles long, with an eventual goal of 1,300 total miles – is one of only 11 scenic trails in the country, and one of three contained in a single state. Though the Appalachian Trail (AT) and the Pacific Crest Trail (PCT) are arguably the most famous trails in the system, the FNST offers hikers the opportunity to walk through a wide variety of subtropical habitats. Moreover, unlike the grueling trails of the AT and PCT, the FNST is mostly flat, providing access to those of varying fitness levels. The FNST is a testament to public-private partnerships. 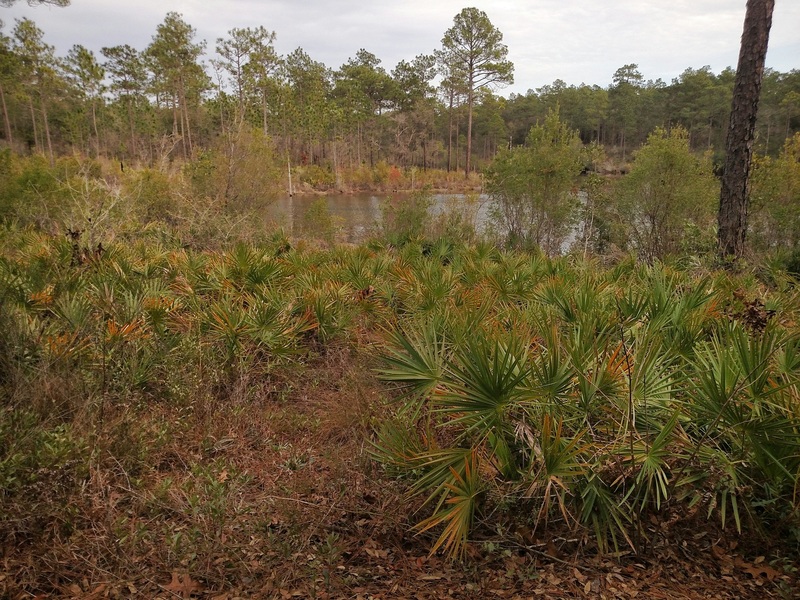 I walked a section of trail that wove through Eglin Air Force Base; other segments are within state parks, national seashores, private land with owners who have agreed to let hikers onto their properties, and more. The resulting benefit to nature lovers is substantial. By the end of the afternoon, my husband and I had walked nearly seven miles, spotting birds, a beautiful pond, and the tracks of raccoon, deer, and turkey. Maybe someday I’ll hike the entire trail; either way, I definitely appreciate having the historic path so close to my home! Very interesting. Reading about Florida is totally new to me. Lovely writing, too. It’s nice to hear about this trail- I’ve never heard of it! I’ve done some wandering through the state parks and refuges up near St. Augustine, and hiking in Florida is quite enjoyable. I can picture the sandy trails and subtropical forests, and I’m happy to see someone else taking advantage of the abundant and diverse bird population! It is long hiking trail. I think that it is very gorgeous rail. I love hikes, but only day hikes. In Finland in the northernmost part called Lapland there are nice trails for hiking on the Arctic fells. Freely roaming reindeers are friendly and they fill landscapes. These regions are far away from the Arctic Circle. Experiences are mighty.